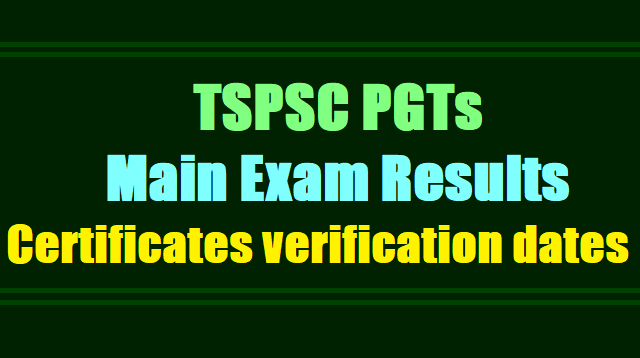 TSPSC PGTs Final Selection List Results. TSPSC PGT Final Selection list Results of Physical Science, Biological Science, Social Studies, Maths. Certificates verification dates 2017, Web options/ TSPSC PGT Maths, Biological science Main Exam Results, Certificates verification dates 2017, Web options: TSPSC PGTs Main Exam Selection List Results 2017, TSPSC PGT Languages Mains Selection List Results 2017, TSPSC PGT Hindi, English Main Exam Results, Certificates verification dates, List of Documents to be produced at the time of Verification of Original Documents. TSPSC PGT Hindi, English Main Exam Results: It is hereby notified that on the basis of Main Examination held on 27/08/2017 and 28/08/2017 for the Post of PGT (Hindi & English) in various Residential Educational Institutions Societies, 434 candidates with the following Hall Ticket Numbers are provisionally picked up in the ratio of 1:2 for Certificate Verification against total No. of 235 vacancies. On the basis of the Main Examination held on 18/07/2017 and 19/07/2017 and subsequent Certificate Verification process held on 20/10/2017, 31/10/2017, 01/11/2017, 02/11/2017, 08/12/2017, 15/12/2017 and 19/12/2017 at Sankethika Vidya Bhavan, Masab Tank, Hyderabad for Direct Recruitment (General) to the post of Post Graduate Teachers (Mathematics, Biological Science, Physical Science and Social Studies) in various Residential Educational Institutions Societies 475 candidates with the following Hall Ticket Numbers have been provisionally selected for appointment to the post of Post Graduate Teachers (Mathematics, Biological Science, Physical Science and Social Studies) in various Residential Educational Institutions Societies Notification No.13/2017, Dt: 14/04/2017. However, the results of the VH candidates will be declared later. The selections are published here-with subject to the following conditions. If it comes to the notice of the Commission later that any candidate furnished false information or the selection is not in order due to any act of omission or Commission of any candidate then his/her provisional selection is liable to be cancelled at any stage and they will forfeit all consequential benefits including that of selection. pending, if any, before the Hon’ble Courts of Law . Further, the selected candidates who are picked up for TGT Certificate Verification were requested to relinquish their claim for TGT posts so as to enable the Commission to fill up the relinquished vacancies with next meritorious candidates in TGT duly giving opportunity to other deserving candidates. The Commission website www.tspsc.gov.in may be visited for further details.